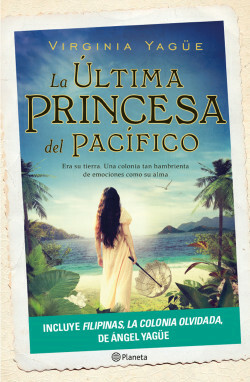 La última princesa del Pacífico tells of the coming of age of Carlota Díaz de la Fuente, who is Spanish but grew up in Spain’s most remote and forgotten colony: the Philippines. Carlota’s fate is to come of legal age and formalize her marriage in 1896, when rumours of a possible revolution start to spread and a rebel movement fights for independence from the Spanish crown. Over the next two years, Carlota will experience a series of revelations that will make her aware of the political and social reality of the colony, the changes coming with the end of the century and her frustrations as a woman. Her journey will culminate with an unexpected love and a painful but definitive bereavement during the siege of Manila and the loss of the colony to the United States. A forgotten colony, an enchanted land, a woman ready for anything. Evocative, suggestive and full of extreme emotions, La última princesa del Pacífico is destined to be the next big hit in historical romance fiction. A novel that evokes colonial times and relives a forgotten episode of history. It has all the ingredients to become the next romance bestseller: survival against the odds, impassioned love, a struggle with destiny, jealousy, intrigue and mystery in the exotic, sensual setting of the Philippines. Full of emotions, intoxicating landscapes and fascinating characters, this brilliant romance novel will tug at the heartstrings of an extensive reading public.